Notification boxes are a great way to update your visitors with new updates to your blog posts. You can write an important message in the notification box or you can also write a disclaimer in an alert box for your readers. It didn't take me more than 2 hours to design these responsive and fancy notification boxes for Blogger. I will surely be using them from now on in my blog posts and I am giving them to all Blogger or Blogspot users completely free! 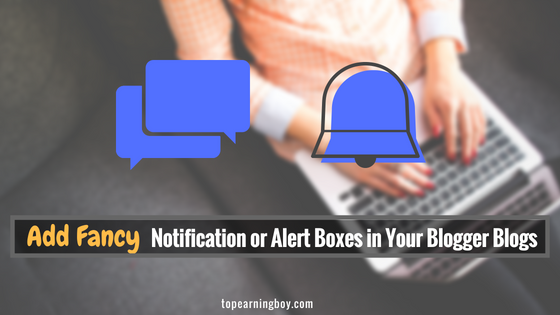 In this tutorial we will add four different notification boxes: success, alert, warning, error. I used amazing Oswald font and Font Awesome icons for giving fancy touch to our notification boxes. So first we will add their source links in our template then we will add CSS and ultimately I will share HTML for each box that you will use while writing your blog post. Note: You can skip this step if you have already added these fonts in your template! Above that tag paste the following CSS code. Now while writing blog post, you will switch to the HTML mode and paste any of these codes. Replace Your Message goes here with your custom message. Need any kind of help, feel free to contact or comment in the section below. Hope these fancy notification boxes enhance your blogging experience. Add the boxes in your blogs and let me know in the comments. Thanks for taking out time and reading my tutorials. May Allah bless you all!